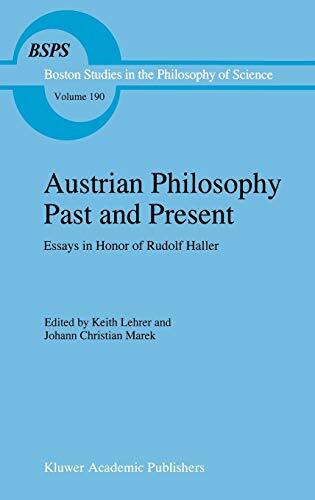 Synopsis: This book is about Austrian philosophy leading up to the philosophy of Rudolf Haller. It emerged from a philosophy conference held at the University of Arizona by Keith Lehrer with the support of the University of Arizona and Austrian Cultural Institute. We are grateful to the University of Arizona and the Austrian Cultural Institute for their support, to Linda Radzik for her editorial assistance, to Rudolf Haller for his advice and illuminating autobiographical essay and to Ann Hickman for preparing the camera-ready typescript. The papers herein are ones preseJ,lted at the conference. The idea that motivated holding the conference was to clarify the conception of Austrian Philosophy and the role of Rudolf Haller therein. Prof Rudolf Haller of Karl-Franzens University of Graz has had a profound influence on modern philosophy, which, modest man that he is, probably amazes him. He has made fine contributions to many areas of philosophy, to aesthetics, to philosophy of language and the theOl)' of knowledge. His seven books and more than two hundred articles testify to his accomplishments. But there is something else which he did which was the reason for the conference on Austrian Philosophy in his honor. He presented us, as Barry Smith explains, with a unified conception of Austrian Philosophy.